This expert group report identifies policy options for strengthening Responsible Research and Innovation. Responsible Research and Innovation (RRI) refers to the comprehensive approach of proceeding in research and innovation in ways that allow all stakeholders that are involved in the processes of research and innovation at an early stage (A) to obtain relevant knowledge on the consequences of the outcomes of their actions and on the range of options open to them and (B) to effectively evaluate both outcomes and options in terms of societal needs and moral values and (C) to use these considerations (under A and B) as functional requirements for design and development of new research, products and services. The RRI approach has to be a key part of the research and innovation process and should be established as a collective, inclusive and system-wide approach. 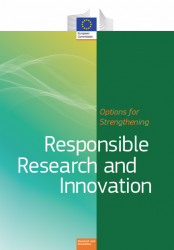 Published by the European Commission (2013), Options for Strengthening Responsible Research and Innovation (pdf file on ec.europa.eu, last accessed 18 Dec 2013).